What were your dreams when you were four? Little Chap is hurtling towards his Half Term holiday now at school. Judging by the many meltdowns we have had in the last 48 hours, over the sort of stuff that would never usually concern him one bit, I would think either we are nurturing some particularly horrid virus about to rear its ugly head and spoil the fun we now have planned for the next few weeks or Little Chap is just.plain.shattered and never been more ready for the holidays! Either way, it’s been a pleasure to chatter away with him lately. We had a play date after school the other day with a friend of his who lives a little further away than most of the boys in his year and so we had an unusually long 20 minutes or so, while I drove us there from school. During which time, I quizzed Little Chap about a sticker he came out of school wearing and the certificate I had found while rifling quickly through his book bag in the school car park! I was intrigued. Apparently, the Perform Theatre Company visited the Reception class at school that afternoon and boy, was he full of it. The visitors had obviously enthused Little Chap and caught his interest entirely. So much so, that he asked me if he could go to drama school when he’d finished regular school because then “I would put lots of plays on the stage with my team, Mummy. Like Charlie and Lola“. Later, while still driving to this play date, he told me he’d just seen a billboard poster, advertising Turbo 3D, the film we were lucky enough to be offered preview tickets for last weekend and then proceeded to tell me how he’d like to put that story on the stage and how he would like to play the part of Turbo the snail! Bless him! The film obviously resonated as much as the theatre group’s visit. The theme of the film is very much that of the underdog – no dream is too big, no dreamer too small – and so I smiled as I told Little Chap that Mayfair Dad and I would always try to support him in fulfilling his ambitions, whatever they are. 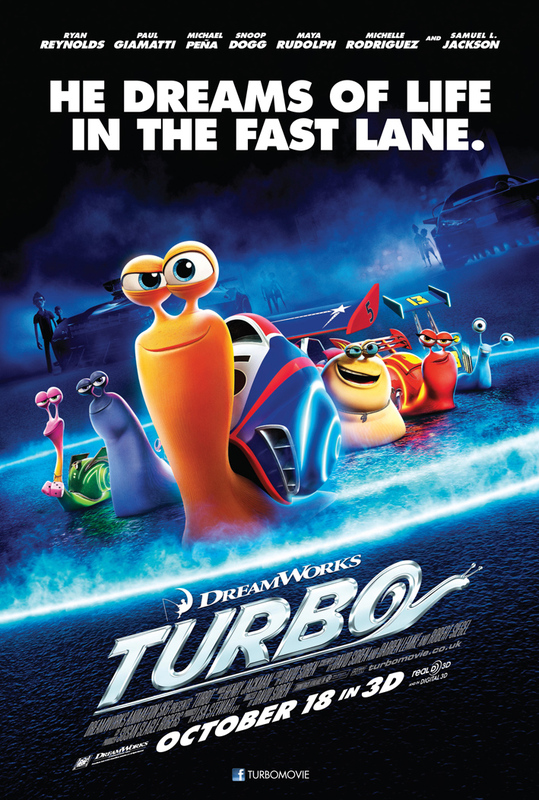 Turbo is the latest and (in Little Chap’s opinion, the greatest) animation from those genius people at Dreamworks. Don’t think Mayfair Dad and I dispute that, either! Poor Theo the Snail isn’t so lucky though. His brother Chet is not so generous with his support of Theo’s ambitions, preferring to agree with the other snails – that life in the slow lane is the only option. Theo dreams of life in the fast lane. Not something you might think one of the slowest of God’s creatures would be considering. Well, Theo obsesses. He watches race cars on TV. He imagines he is a racing car winning as he slides to work at the tomato harvesting plant, where he play acts some more race winning scenarios. Unfortunately though, the other snails laugh at him and rubbish his dreams to the point where he leaves “town” where a freak accident gives him the power of super-speed. But having his dream speed doesn’t make his life any easier and he leaves town again for new adventures and to pursue his dream. Along the way, he meets another big dreamer, one of the Dos Bros (two brothers), Angelo and Tito who make tacos at (you guessed it!) Dos Bros Tacos, in a dead beat strip mall in Los Angeles. As one of them implements his ever more insane strategies to drum up more business for the mall, the other rains on his parade, much like the relationship between big dreamer Theo and brother Chet. Theo’s new-found super speediness turns him into Turbo and he meets a crew of other speed-freak snails who set out to help him achieve his dream of winning a race – at the Indy 500 no less! And that’s when things get really exciting! Turbo is on general release in UK cinemas from October 18th, making it ideal to book for a Half Term treat. Kids and grown ups will enjoy it equally. Cast: Ryan Reynolds (X-Men, Green Lantern, The Proposal), Paul Giamatti (Saving Private Ryan), Michael Pena (Million Dollar Baby, The Lincoln Lawyer), Luiz Guzzman, Bill Hader, Richard Jenkins, Ken Jong, Michelle Rodriguez (Avatar, Fast & Furious), Snoop Dogg (a.k.a Snoop Lion) and Samuel L. Jackson. Little Chap, Mayfair Dad and I all really enjoyed this film and I hope I’ve reflected this in how I’ve rated it. They characterised snails for goodness sake and they did it so brilliantly! I won’t give it away but it was a nail biter and had Little Chap on his feet with excitement/nervous tension. I may have punched the air! Disclosure: We received complimentary tickets to view Turbo 3D, however all views are my own. This entry was posted in Little Chap Sees, Reviews & Recommendations and tagged dreams, Dreamworks, family film, humour, kids, Michelle Rodriguez, reviews, Ryan Reynolds, Samuel L Jackson, snails, Turbo by Mayfair Mum. Bookmark the permalink.